The Creative Industries Fund NL invites architects, designers and makers to submit a proposal for research, an experiment or development of new knowledge within a practical environment, such as a lab, development site or workplace. With this call, the Fund aims to enable designers to create an environment together with a partner, where joint experimentation, the establishment of new relationships and the sharing of knowledge are central. This open call has ended. Find more information about the selected projects here. The Creative Industries Fund NL is making € 200,000 available for this open call. The maximum contribution per project is € 25,000. The conditions for support are that there is a new collaboration between a maker and a partner that is able to facilitate a practical environment. Depending on the project, the collaborations can vary in form. Examples are research (including material research) within a lab, a residency programme at a knowledge institute, a special collaboration with a development site or experimental research with a partner from the business community. The subsidy is divided into two parts: € 15,000 is reserved for the maker and € 10,000 for the partner's facilities and knowledge. The amounts are granted under the conditions of a collaboration agreement that must be submitted no later than 4 weeks after the grant has been awarded. A format for the agreement follows after awarding. a form of knowledge-sharing relevant to the project is included at the end of the project. The application can be submitted until Wednesday 28 November 2018 at the latest via the Creative Industries Fund NL online application environment. Select the 'Open Call' followed by 'Space for Talent round'. 5.	an extract from the Dutch Chamber of Commerce (KvK) register (dated within the last year). If a submission fails to meet the requirements outlined above, no evaluation of the content can take place. Request your login details for the online application environment in good time and familiarize yourself with the application form. Validation of a new user account takes 1 working day at most. You will receive confirmation of receipt by e-mail one week after the closing date at the latest. To receive a grant you must be registered with the Dutch Chamber of Commerce (KvK). promoting artistic quality: the project is aimed at continuing, further developing and profiling one's own talent, while the designer in question is seen as an inspiring example for professional colleagues and audiences with wider interests. 6.	the expected degree to which the plan will lead to an inspiring example for professional colleagues or an audience suitable for the project. The evaluation takes the form of a tender: within the available budget, a number of proposals will be chosen in preference to others. Where there are equally prioritized proposals, preference is given to proposals that contribute to the regional distribution of activities across the Netherlands. Subsequently, priority is given to proposals that contribute to the disciplinary spread. Designers who at the time of application are receiving support from the Grant Programme for Talent Development cannot apply within the context of this open call. Also excluded are research/residency places that are part of activity programmes being supported in the period 2019-2020 under the Grant Programme for Multi-year Programmes. Finally, institutions that already receive funding from the Basic Infrastructure for Culture (BIS), educational institutions or postgraduate institutions are not eligible for subsidy under this Open Call. 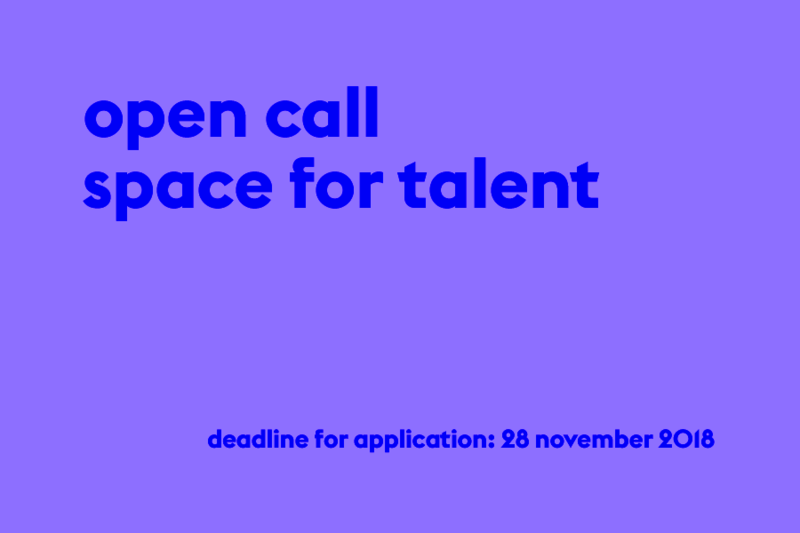 The Creative Industries Fund NL is making a maximum of € 200,000 available for this Open Call. The maximum contribution per application is € 25,000, of which a maximum of € 10,000 is for the partner. The subsidy is intended for activities in the Netherlands that contribute to the artistic and/or professional development of designers and makers from the creative industry. The selected proposals will receive a grant from a supplementary budget made available by the Ministry of Education, Culture and Science for talent development and workplaces in the creative industry. The selection will be announced by e-mail and on the Fund's website at the end of December. In March 2019, during 'Bring it On', the Fund is organizing a meeting with the selected proposals. The aim is to exchange knowledge and experiences and to make them public. For questions about the open call and procedure, please contact Marieke Ladru by e-mail or 010-436 1600 by telephone.